Ajay Maken said that 40,000 forms for identity cards from party workers have been received, while around one and a half lakh to two lakh Congress workers are expected to participate in the rally. 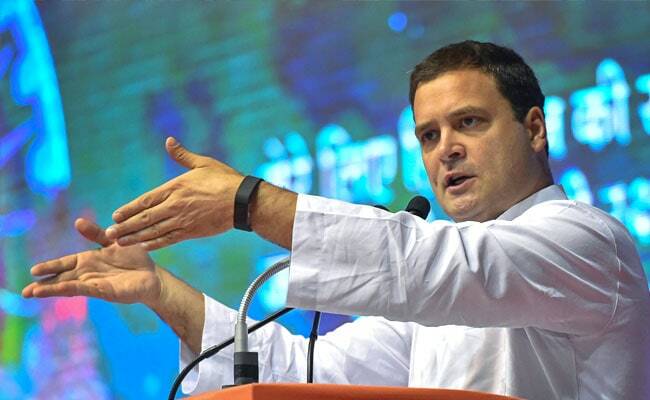 New Delhi: Congress President Rahul Gandhi will address a public rally at the Ramlila Ground in Delhi on April 29, the party's Delhi unit chief Ajay Maken said today. Mr Maken said that the 'Jan Aakrosh Rally' - Mr Gandhi's first in the national capital since assuming the top party post, will be "historic". The Delhi Pradesh Congress Committee or DPCC chief in a statement said that 40,000 forms for identity cards from party workers have been received, while around one and a half lakh to two lakh Congress workers are expected to participate in the rally. "Full preparations have been made for the Jan Aakrosh Rally to be addressed by Gandhi. Delhi will sound the bugle for Rahul Ji's triumphant journey to the 2019 parliamentary elections," Mr Maken said. Delhi has seven Lok Sabha seats. In the last elections in 2014, the BJP had won all seven seats, as it stormed to power at the Centre putting to an end the 10-year rule of Congress. He said 14 water dispensing stalls will be setup for the rally taking into consideration the prevailing hot weather. Mr Maken said proper arrangements would also be made for the parking of vehicles coming from Delhi and outstation areas, and various committees have been formed, who have been meeting regularly. Meanwhile, Mr Maken also welcomed back former NSUI and Delhi Youth Congress president Amit Malik, former DPCC secretaries Jaikaran Choudhary and Parvinder Sharma into the party fold. He said it was a matter of happiness that these leaders have returned to the Congress, adding that with the return of Mr Malik, the party will be further strengthened in Delhi.